Years ago I saw a model of Hatshepsut's mortuary temple at the Metropolitan Museum In New York. I was mesmerized, it seemed so modern, linear and elegant against the rock outcrop above. 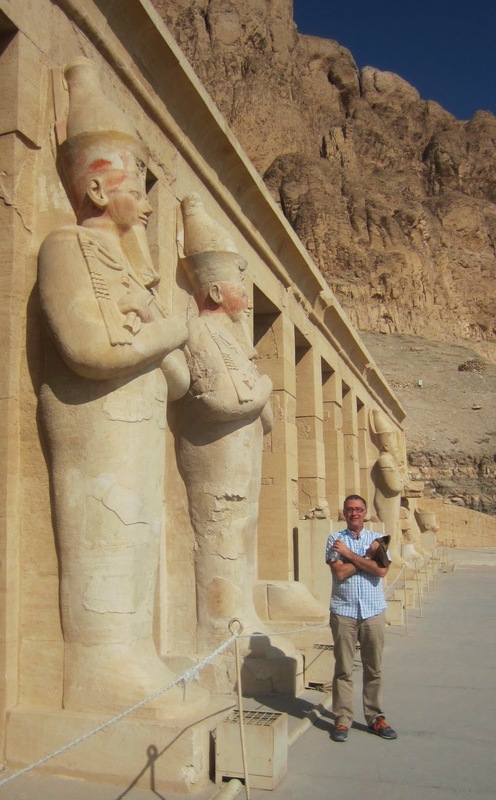 I knew it was somewhere I wanted to visit and the more I read about Hatshepsut, the Queen who ruled as King, the more interested I became. 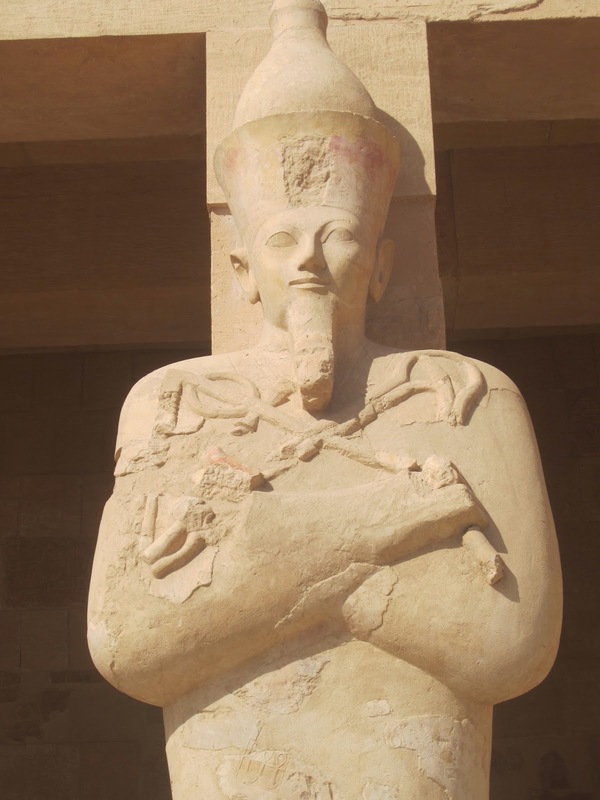 While we absorbed Hatshepsut's history, the long regency for her stepson Tutmoses III and his subsequent, and mysterious erasure of her images, we seemed to have more difficulty pronouncing her name. That is until we heard some tourists repeating the immortal lines from their guide, "Hat-Cheap-Suit"! 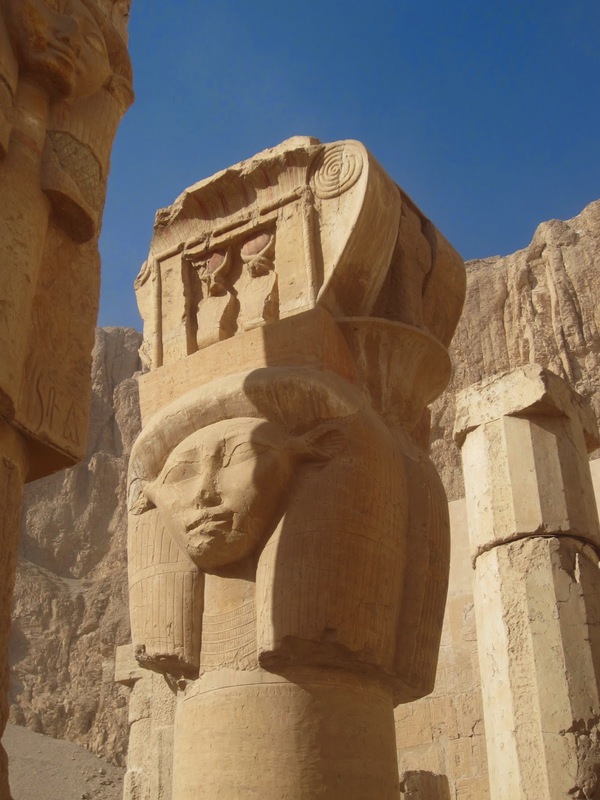 The story of Hatshepsut seems shrouded in supposition and suggestion, but it is certainly true that her images were systematically erased during her stepson's rule. It's fascinating to see the ways in which she is chiseled out though her image is not replaced with anything else. 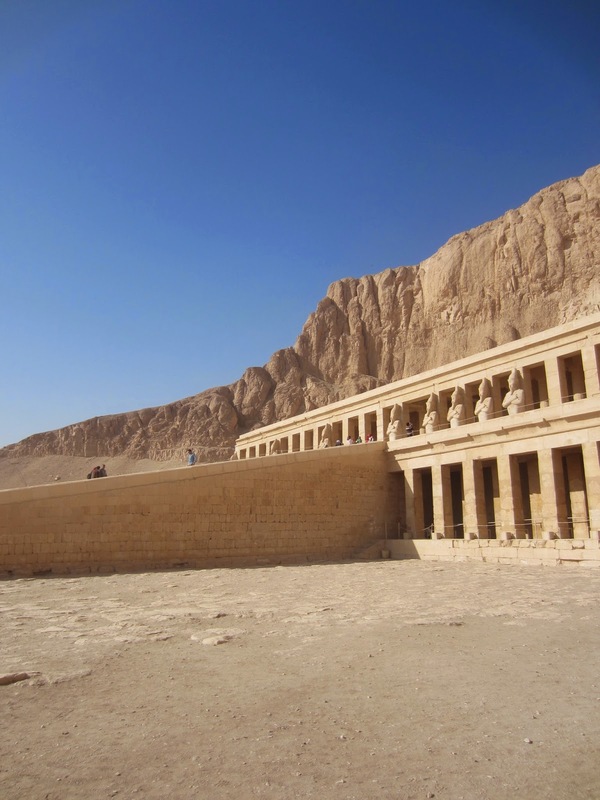 The Mortuary Temple was interesting for it's innovative architectural form and several decorative frieze, one depicting the godly origins of Hatshepsut and another detailing the journey to the land of Punt, a significant foreign adventure during her reign. Of course the site has other temples and was renamed and reused later though it has been restored to it's form during the Hatshepsut period. The image below is from the Punt campaign. As you can see above, some of the carving is highly detailed, here are several cartouches including the birth name and king's name. I love the level of detail in these hieroglyphics. From the outside it looks very classical and it reminded me of some of the neoclassical buildings we saw in Rome at Mussolini's EUR. There is a modernity here when you approach on foot. Below is a wonderful painted frieze illustrating offering made to the Anubis. Decoratively it reminds me of images from the 1960's. We saw similar representations of Hathor (below) throughout Upper Egypt. Below, you can ever see red paint remaining on the statues and D. imitating them. Probably not a good idea as this was the "death" pose! While there weren't many tourists at the temple it was overrun with school groups who delighted in running down the main ramp at high speed, much to the horror of their teachers. 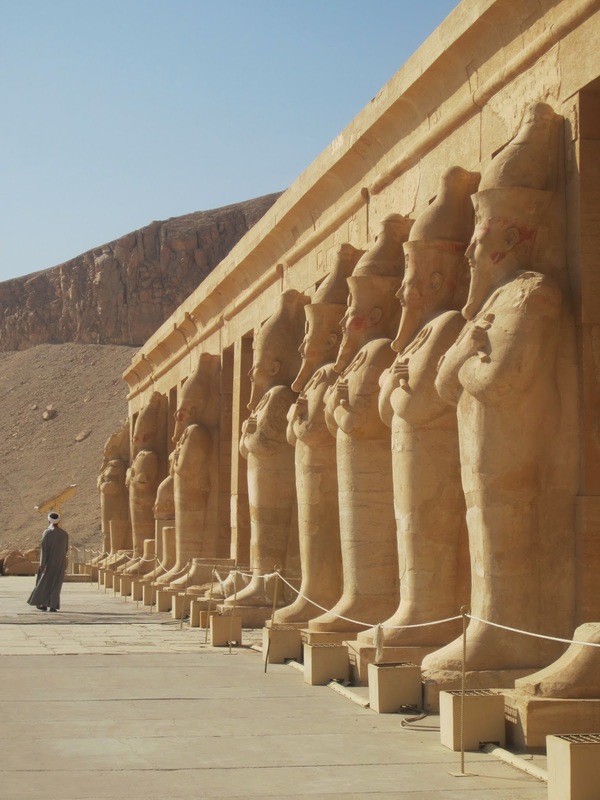 However, Deir el-Bahri is clearly on the day trip circuit and there are buses that come in from the Red Sea bringing tourists for a day trip covering Luxor, Karnak, the Valley of the Kings and Queens. Even without the three hour drive there and back it sounds like a ghastly experience, the only reassurance we had was that these groups have so little time that they come and go very quickly. You just need to wait patiently for them to leave. Tip: You can take a small shuttle from the visitor's center but I recommend walking the short distance, which gives you time to absorb the impact of the architecture. You can't come here without remembering the 1997 massacre of 62 people carried out by extremists. Given this I was surprised there wasn't heavier security at the site, but there was the usual cursory metal detector and when I remarked on the tragedy the guide pointed out several security posts located on the top of the escarpment. Despite my awareness of what had happened here, I have to say we felt safe and welcomed everywhere we went in Egypt. Don't be deterred from visiting.